Nelson Maths: Australian Curriculum provides between 30 and 35 units of work for each year level, with each unit of work divided into three Lesson Plans. Providing flexibility, the Lesson Plans can be tailored to cater for students’ different learning styles and diverse needs. Teachers are provided with a variety of opportunities to assess their students’ understandings for future planning and learning. The Student Books feature engaging tasks that students can complete independently. Each Student Book includes three pages of activities for each unit, one assessment page per unit and the linking Australian Curriculum content strand, descriptor and code for that unit. A 'Maths Talk' (glossary of terms) section is also provided. The Teacher's Resource Book has up to 35 units covering the Australian Curriculum content strands. Each Teacher's Resource Book contains Assessment Task Cards, Tests and Assessment and Planning BLMs. There are two CD-ROMs, one featuring all Nelson Teaching Objects, the other containing all BLMs, Tests, Answers and Assessment Task Cards as printable PDFs. Download BLMs for Foundation, Year 1 & Year 4 in addition to those currently provided on the Teacher's Resource Book CD-ROM. 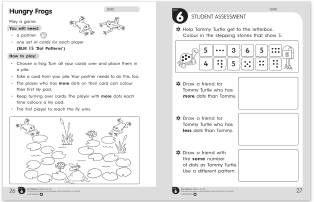 The 6+ Extension Tasks Teacher’s Resource features activities to extend more able students who would benefit from more challenging learning tasks. It also provides ‘bridging’ activities into the Year 7 curriculum. Information and Communication Technology (ICT) is integrated throughout Nelson Maths: Australian Curriculum. The Nelson Teaching Objects (NTOs) are provided for use on interactive whiteboards and individual computers. require students to use their mathematical understandings in an engaging and meaningful context. Nelson Maths: Australian Curriculum provides opportunities to assess student progress throughout the program using a method best suited to their needs. Recommendations for future learning are linked to these assessment tasks. on a daily basis during mathematics sessions. The Nelson Maths Building Mental Strategies Big Books support children in their first, second and third years of school in the development of sound mental strategies that will work for them in a variety of contexts. The Big Books can be used in conjunction with the Nelson Maths: Australian Curriculum F-3 student books. The Nelson Maths Building Mental Strategies Skill Books are four write-in workbooks which support the learning and development of mental strategies in the areas of counting, place value, addition, subtraction, multiplication and division. The Building Mental Strategies Big Books and Skill Books support the Australian Curriculum: Mathematics and are referenced throughout the Nelson Maths: Australian Curriculum series.